The November 15 Hard Fork of BCH has divided the crypto world into two sides. One side represented by the Craig Wright and his claim of BSV being the original Use case of the Bitcoin, while the other side was lead by Roger Ver in favor of BCH ABC, now known as just BCH. The controversy is defying all odds and finds its way to crop up now and then. It all started with the lead up to the 15th November event, where both the sides were claiming to be the primary form of currency. 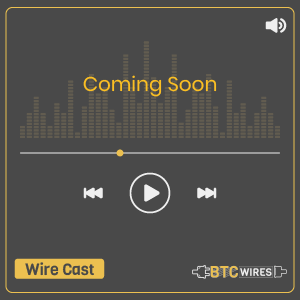 Roger Ver side made technical changes regarding block size in the existing Bitcoin cash and came up with BCH ABC. Craig Wright was holding the baton for BCH SV always maintained that BCH SV is the original bitcoin as it has been developed on the principles of original bitcoin white paper. The war escalated when Craig Wright threatened the Roger Ver side with binary trading and Hash war. Nothing of that sort ever happened, but the bad blood never died down. Both the parties maintained being the Alpha in the game. The earlier trends clearly showed Roger Ver BCH ABC winning all the battles regarding Hash power, a much broader acceptance from various exchanges, market capitalization and even the number of blocks mined. That does not mean BCH SV was out of the race, it always kept its neck high and fought the battle continuously. Craig Wright even predicted that these small battles wouldn’t mean anything once BCH SV overtakes the BCH ABC. His predictions are coming true. In a shocking turn of events, BSV has flipped its rival to overtake it not only regarding price but also in overall market capitalization ($1.88 billion vs. $1.78 billion). 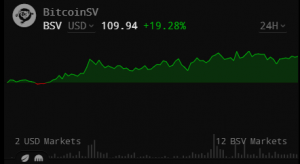 At the time of writing, BSV was trading at $109. 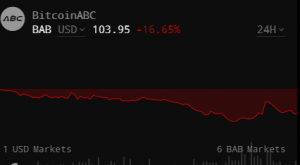 94 while BCH ABC at $103.95. When the whole market was bleeding due to continuous bearish trends, with Bitcoin touching the lowest price mark in years, BSV was defying all odds to mark a jump of 21% in last week. You May Also Read: Bitcoin Cash Fork War: Are We Going to Use Two Different Versions of BCH? 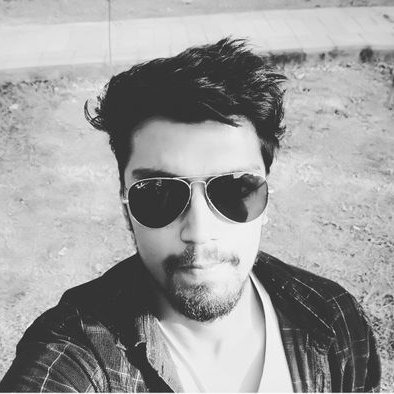 The Fork flipping by BSV has forced many crypto enthusiasts to put up their thinking caps and try to connect the dots to understand the change. The Reddit is abuzz with rumors of market manipulation by big whales. Whatever may be the fundamental reasons behind the change in trend, that led to rising of BSV volume by a massive $168 million double that of BCH ABC. We must have to wait and watch the market in the coming days to understand the situation better. The recent news of United Corp launching a lawsuit against Bitcoin.com and its founders for hijacking the BCH network might have been the fuel to this unprecedented change in market capitalization. There have been rumors about big whales who were against the Roger Ver side, and Bitcoin.com saw an opportunity and started dumping their big stocks on the BSV network and buying BSV in huge chunks. Till the outcome of the lawsuit filed by United Corp comes into the public domain, it would be early to make predictions. as we have seen from the latest developments how wrong people can be while judging something on early inputs.